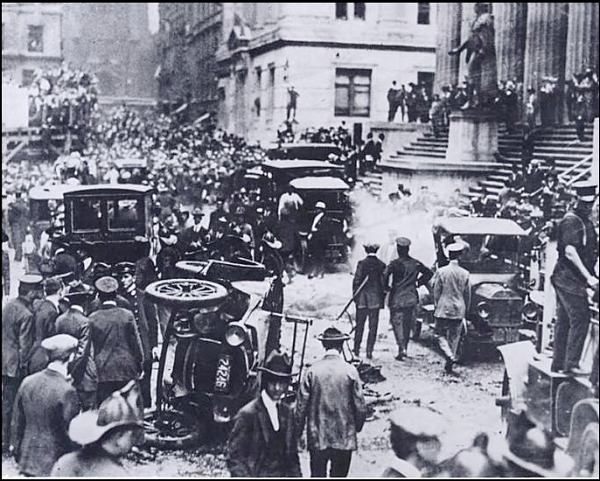 Did you know that, nearly 100 years ago, Wall Street, near the Stock Exchange, was bombed and the perpetrator was ever caught? Back in August while Caroline and I walked towards Federal Hall and before we headed to Trinity Church, she told me the story. This came up because 23 Wall Street, the building running along the thoroughfare, was owned by J.P. Morgan and he refused to fix the damage done to the side of the building. The damage is still visible, as my photos attest. A bomb was set off just a few feet down from Federal Hall, at 12:01 pm, right at the start of lunchtime, and the blast killed 30 people instantly; 8 more died in the aftermath, and hundreds were maimed, some permanently. 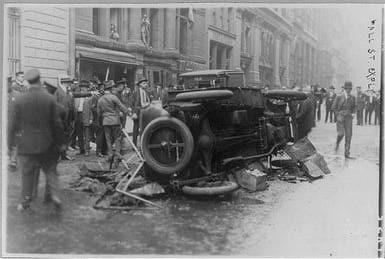 Evidence found at the scene implemented anarchists in the bombing. Because it was imperative that the Stock Exchange reopen the next day, the street was cleaned up overnight, thus inhibiting the investigation. (The police did not have enough time to perform it.) This, perhaps more than any other reason, is why the crime was never solved. 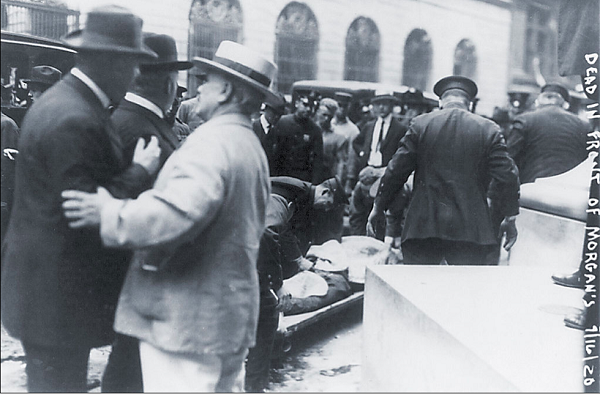 This attack was probably linked to the Sacco and Vanzetti trial, which ended days before. Sacco and Vanzetti, the two Italian anarchists arrested for the robbery of a bank and the killing of a guard, were found guilty in a trial that is still studied by history and law students as an example of how prosecutor prejudice and judicial bigotry can completely bias a jury and undermine due process. I studied the case as an undergraduate and examined some of the trial transcript. Both men were executed. Wikipedia, from which I took two of the photographs, has an interesting entry on the attack. The entry mentions a Mario Buda as the probable terrorist, since he had the technical skills in making bombs and was in New York City at the time. Shortly thereafter, he left the United States and returned home, never to set foot in the United States again. Unfortunately, there is no Wikipedia entry for Buda. (The link brings you back to the Wall Street bombing article.) The article also states that Buda knew Sacco and Vanzetti. I don’t know much about the Galleanists (the anarchists who were active in the U.S. in the early 1900s and liked to blow up things), except for what I learned in studying the Sacco and Vanzetti trial. Apparently J.P. Morgan, who owned 23 Wall Street, was so angry over the attack that he refused to fix the damage done by the blast, so that’s all that’s left to show that there actually was an explosion. The very next day, after the Stock Market had reopened, there was a huge rally in support of Wall Street. The attack on Wall Street in 1920 and the World Trade Center attack in 2001 were directed against the U.S. financial system as well as capitalism. Sadly, both attacks cost innocent lives.